"Narrative as Witness: America's Untold Stories"
The Grace A. Tanner Center was pleased to host the 2017 Grace Adams Tanner Lecture in Human Values delivered by distinguished guest speaker, Maria Hinojosa on October 19th 2017. Maria Hinojosa is an award-winning journalist known for her exploration of overlooked stories and examination of underrepresented communities. In her more than 30 years as a journalist Hinojosa has reported on many human rights issues related to poverty, violence, and immigration. She was among the first to report on the youth violence that plagues urban communities, and has received particular attention for her report “Lost in Detention” for Frontline which explored abuse in immigrant detention facilities. Hinojosa is the recipient of four Emmys; the 2012 John Chancellor Award for Excellence in Journalism; Robert F. Kennedy Award for Reporting on the Disadvantaged; the Studs Terkel Community Media Award; the Edward R. Murrow Award from the Overseas Press Club for best documentary for her groundbreaking “Child Brides: Stolen Lives.” She is currently the anchor and Executive Producer of the Peabody Award winning show Latino USA,and of the PBS show America By The Numbers with Maria Hinojosa. 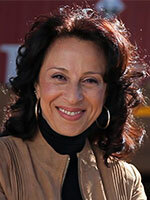 A recording of Maria Hinojosa's lecture "Narrative as Witness: America's Untold Stories"